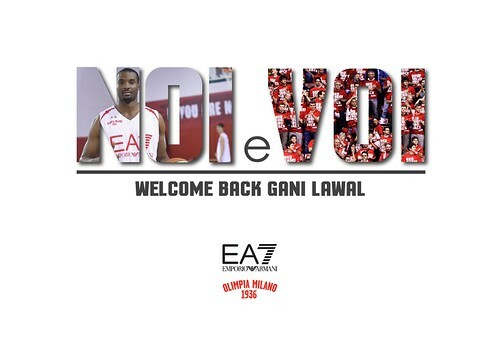 Pallacanestro Olimpia EA7 Emporio Armani Milano agreed on terms on a one-year contract with center Gani Lawal, 2.06, born in College Park, Georgia, on November 7, 1988, holder of a Nigerian passport. Lawal played fron Trabzonspor during the last season and Panathinaikos. Two years ago he was a valuable member of Olimpia’s championship team. WHO’S LAWAL – Growing up in Norcross, Georgia, close to Atlanta, Gani Lawal attended the Riverdale High School before transferring to Norcross for his last two years of eligibility. In 2006 and 2007 with Norcross he won the state of Gerogia championships. In his last season he had 18.4 ppg, 8.1 rpg, 2.7 blocks per game and was named “Mr.Basketball” and included in the McDonald’s All-American Game. Lawal played three seasons at Georgia Tech in Atlanta. As a freshman he scored 7.2 points per game with 3.5 rebounds and led the team in blocked shots with 32 and had a 57.0% shooting percentage. As a sophomore, he was named in the All-ACC third team, averaged 15.1 points per game and grabbed 9.5 rebounds. He also scored a career-high 34 points against Penn State. In 2009/10, as a junior, his averages went down a little, to 13.1 points and 8.5 rebounds per game but he was the team leader in points and rebounds for the second consecutive year and was once more included in the All-ACC third team. In 2010 he declared for the NBA draft one year early and was picked by the Phoenix Suns with the number 46. He played only one game, then a injury closed his rookie season early. During the 2011 NBA lockout he signed for Zielona Gora in Poland: when the lockout ended he came back to Phoenix but was released. Then he signed for San Antonio and was released again. In 2011/12 played in China for Xinijang and then in Roanne, French league. In 2012/13 he played for Roma, averaged 13.7 points per game and also 8.4 rebounds and 1.5 blocks while shooting 62.6% from the field and a career-high of 34 points versus Sassari. He finished the season as the best rebounder in the league, the second best shot-blocker behind Bryant Dunston. He appeared in 47 games and helped Roma reaching the finals. During the summer he had a brief experience in China and one in Latvia (VEF Riga). Before signing for Milano, he was at the Philadelphia 76ers training camp. In Milano, he helped the team to win the championship and reached the Euroleague’s quarterfinals. Last season ho moved to Trabzonspor in Turkey averaging 9.9 points per game and 5.6 rebounds. Then he transferred to Panathinaikos Athens. NOTES – At Georgia Tech he played along two future relevant NBA players such as Derrick Favors (Utah) and Iman Shumpert (New York)… He was the 39th Georgia Tech player to surpass 1000 points scored. He finished his college career as 31st ever in the scoring standing, 12th rebounder and sixth shot-blocker… He also declared himself for the 2009 NBA draft but withdrew his name… He’s been a Nigerian national team member… His father, Gani sr., works in real estate and mortgages in Atlanta. He has two sisters and one brother.